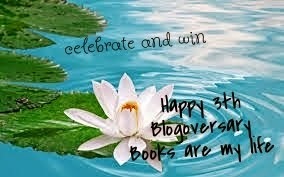 HAPPY 3th BLOGOVERSARY BOOKS ARE MY LIFE!!! I’m happy today,because it’s pasted 3 years since I start this book blog.I had this passion for books since my early childhood and I have it now. I want to say thank you for all those authors,publishers and especially for my readers and followers for their support, so THANK YOU!!! without you this blog couldn’t exist! So, to share my happiness with you I have one big GIVEAWAY for you my friends!The giveaway is open INT. and the books are e-books. Thanks to all authors which generously give their books and Huge Thank You to Ellie Campbell sisters for their support,so we have four their books and 10$ Amazon Gift Card. Congrats on your 3 years of blogging Silvy! Thanks,Vicki.I will try to fixed the problem,I do want to know,thank you for telling me that.Your choice is great. I would love to receive the scars of us and the gift card!